Overland Park, a city of fewer than 200,000 in the heartland of the U.S. just south of Kansas City, is an unlikely setting for a terrorist attack. But on April 13, Frazier Glenn Cross, aka Frazier Glenn Miller, brought terror to Overland Park. With the intention to “kill him some Jews,” Miller, former Grand Dragon of the Carolina Knights of the Ku Klux Klan, and FBI informant showed up with weapons in hand at a Jewish community center and a retirement home and murdered three Christians whom he mistook as Jewish. While the authorities needed “more investigation” regarding Miller’s motive, the national media made the obvious connection characterizing the attack as a hate crime. But neither the media nor the authorities dared to call it what it was – a terrorist attack. For Miller, there was no ambiguity. Shouting “Heil Hitler” from the back of a police car, his intentions, and motivations were made clear. His was a political act with a political meaning that at its core was meant to not just intimidate, but terrorize a whole community. Strangely, however, when it comes to acts carried out by the racist, radical right, the media and state authorities seem loath to characterize them as acts of terror. The reluctance to identify the domestic terrorist threat from the radical right is also seen in the U.S. Congress. And what was the response from Congress? Incredibly, the right wing inCongress alleged that the report was a partisan attack on them and as a consequence were able to have the report rescinded and wiped away from the DHS website – and out of the public’s awareness. Burying the DHS report did not result in the elimination of the very real threat posed by the more violent wing of the radical right, a threat being played out by extremist forces throughout Europe, as well as the U.S. The attack launched by F. Glen Miller should not have been unexpected. This individual has been around, and on law enforcement radar, for quite some time. He was at the infamous Klan attack in Greensboro, North Carolina in 1979 that resulted in the deaths of five anti-racist activists and has a long history with some of the most dangerous right-wing elements in the U.S. The real question that a reasonable person might ask and that the media and certainly state authorities would want to answer is, how many more of these individuals might be out there? And there are other questions – why is it that national state authorities fail to characterize acts like the Kansas shootings as domestic terrorism, and does that failure represent a conceptual inability to “see” the threat of radicalized white supremacists or a cynical political decision to downplay the existence of domestic terrorists? The rise of the racist, radical right is not a figment of the imagination, or a partisan political attack. When they show up at anti-Obama rallies with guns in hand or when they attack Jewish schools or gun down African Americans while wearing the uniforms of the police, all of us must recognize the very real threat that we face today in this period of intense anger, scapegoating, confusion and manipulation. We all have a stake in the defeat of white supremacy in all of its expressions. If we fail to engage in the hard struggle to strip away the pretenses of whiteness and its distorted worldview, and prepare people for the ultimate reality that they are going to have to give up most of the privileges of being white and living at the center of the empire, the crazed terror attack carried out by the neo-Nazi in Kansas will be only a harbinger of what is to come. 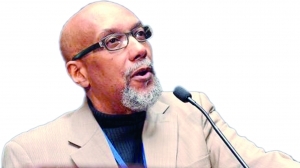 Ajamu Baraka serves as Public Intervenor for Human Rights on the Democracy Branch of the Green Shadow Cabinet.